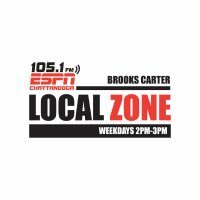 Every weekday from 2-3pm, ESPN Chattanooga Assistant Program Director Brooks Carter talks anything and everything on the local and regional sports front, breaking down high school sports, Chattanooga Mocs, Chattanooga FC and the Chattanooga Red Wolves, and of course some Vols and SEC sprinkled in too. Brooks is local to the Chattanooga metro area, having grown up down the road in Dalton, GA. He is a University of Alabama alumni, and has had previous radio stops at ESPN 102.5 The Game in Nashville, 90.7 The Capstone in Tuscaloosa, AL, and as an intern at Jox 94.5 in Birmingham. He also worked for 2 years in TV with WRCB Channel 3 here in Chattanooga as a Photojournalist. Follow him on Twitter at @BrooksACarter.